The following information is designed to help you understand our Disclaimer Policy. 2000CIGS.com requests that you read the Disclaimer Policy carefully and consult it regularly. The cigarettes are sold on 2000CIGS.com exclusively for personal use and cannot be resold. The Cigarettes sold on 2000CIGS.com are manufactured by worldwide-known tobacco manufacturers. Certain products that require a warning label might not indicate the proper warnings required for your country. The products sold on 2000CIGS.com were not originally intended for sale in the United States and are distributed by a company unaffiliated with Philip Morris Products Inc., JT International, British American Tobacco, or any other tobacco manufacturers. Product names and images used at 2000CIGS.com are for identification purposes only and are trademarks of their respective owners. 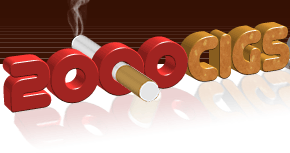 2000CIGS.com is not related in any way or form to Philip Morris Products Inc., JT International, British American Tobacco, or any other tobacco manufacturers. Further, we do not make any claims to ownership of the Philip Morris Products Inc., JT International, British American Tobacco, or any other tobacco manufacturers Trademarks or trade names. By ordering at 2000CIGS.com you declare that you have read, agreed and accepted the terms and conditions contained on this page.